Boutiques Of India, one of South India’s most Glamour’s Handicraft Exhibition is hosting its 3rd edition in Bengaluru city from 23rd to 24th of June 2018. The Grand Exhibition fair will take place at the LaLit Ashok Bengaluru from 10.30 a.m. to 8 p.m. Free entry for all. Boutiques Of India exhibitions are synonymous with the best of designer wear, jewellery, accessories and lifestyle products, all under one roof. The customers get the opportunity to swoop on the bustling Wedding and Lifestyle Market in Bengaluru. 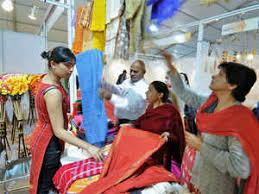 Boutiques Of India Exhibitions is an amazing collaboration of designers, stylists and connoisseurs that have carved a niche in the world of fashion and lifestyle. Operating from New Delhi and Bangalore, they have organized several Wedding & Luxury shows in the last 5 years, covering 70+ shows in more than 20 cities. These flamboyant affairs are visited by the well-heeled and who's who of the city, who gather to catch a glimpse of the latest collections presented by the leading brands from across the country.